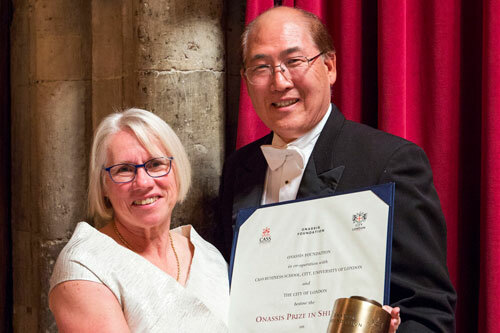 The 2018 Onassis Prizes, awarded to the world’s foremost academics in the fields of finance, international trade and shipping, were presented at the Guildhall in the City of London on Monday 24th September 2018. The awards were presented to recipients by guests of honour, Sheriff Neil Redcliffe, representing the Lord Mayor and His Excellency Mr Kitack Lim, Secretary-General, International Maritime Organisation. Professor Sir Paul Curran, President, City, University of London represented the University, with Professor Marianne Lewis, Dean, Cass Business School. The prizes, each worth $200,000, are sponsored by the Alexander S. Onassis Public Benefit Foundation and awarded every three years by the Foundation in close co-operation with Cass Business School, City, University of London, its Costas Grammenos Centre for Shipping, Trade and Finance, and the City of London Corporation. 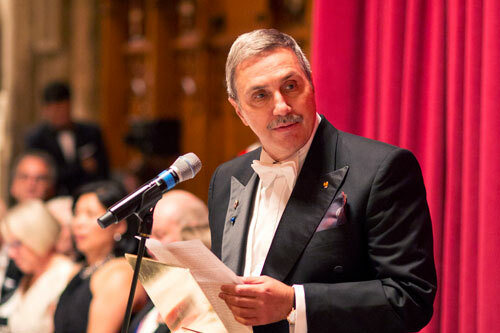 The Prizes celebrate the life and achievements of Aristotle Onassis, the Greek shipping magnate, in the fields of shipping, finance and international trade where he excelled and reflect the Onassis Foundation’s strong commitment to education. 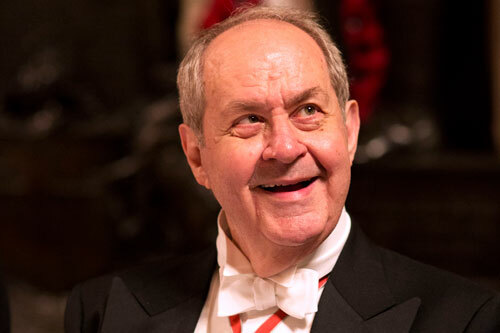 Established in 1975 to honour the memory of his son, Alexander, the Foundation supports initiatives in education, culture and health and is funded by half the profits of the Onassis shipping business. Each of the Prize recipients delivered a lecture on their field of expertise at Cass Business School. 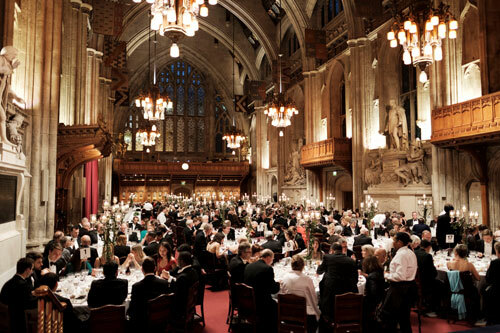 The awards banquet at the Guildhall was attended by academics and senior representatives of the finance, trade and shipping communities of the City of London and other world capitals. 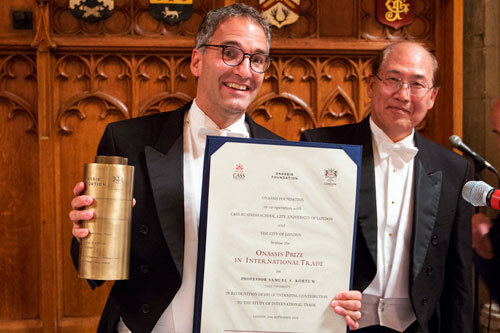 The 2018 Onassis Prize for International Trade is shared between Professor Jonathan Eaton and Professor Samuel S. Kortum. Over the past two decades, Professors Eaton and Kortum have collaborated to develop a model of international trade which integrates geographical factors into traditional understanding of comparative advantage. 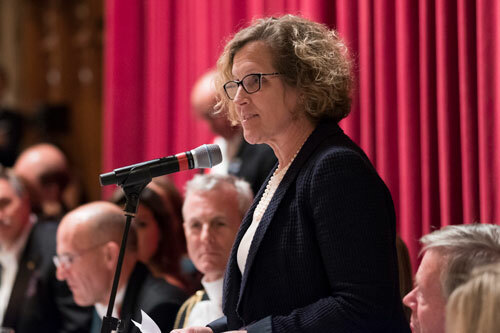 The 2018 Onassis Prize for Shipping was awarded jointly to Professor Emerita Mary R. Brooks of Dalhousie University and Professor Wayne K. Talley of Old Dominion University. 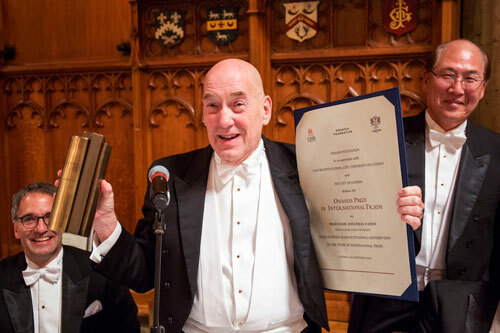 "The Onassis Prizes resulted from the strong co-operation between our Centre for Shipping, Trade and Finance; the Onassis Public Benefit Foundation and the City of London. They recognise the lifetime achievement of leading international academics in the fields in which Aristotle Onassis excelled. I congratulate the five 2018 Onassis Laureates on their success". 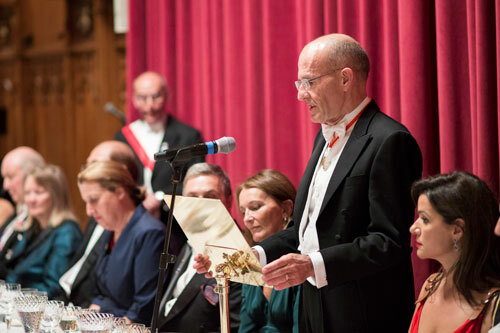 The prize recipients were originally announced in April 2018 at a ceremony in the Mansion House by Alderman David Graves, representing the Lord Mayor of the City of London, Alderman Charles Bowman. 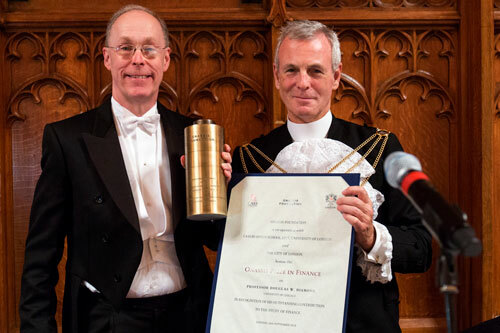 In 2009, the Onassis Prize in Finance was awarded for the first time to Professor Eugene Fama, the Robert R. McCormick Distinguished Service Professor of Finance at the University of Chicago Booth School of Business. Professor Fama went on to win the 2013 Nobel Prize for Economics for his work on portfolio theory and the efficient market hypothesis. Since 2012, the Onassis Prizes in Finance, in Shipping and in International Trade are awarded in their present form every three years. The Onassis Prizes exemplify the Onassis Foundation’s intentions to raise the profile of Greece, on a global level, and to foster science, innovation and research, so that contemporary society may reach its fullest potential. 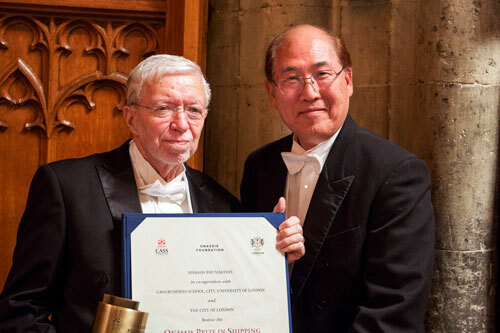 Through the Lindau Nobel Laureate Meetings and the Onassis Lectures, not to mention the thousands of scholarships for the support of Greek studies in universities abroad, the Onassis Foundation strives to support education and create connections and networks around the world, in fulfilment of the vision of its founder, Aristotle Onassis, who excelled in the fields of shipping, trade and finance and was a constant ambassador of Greece worldwide. In 1975, when he died, Aristotle Onassis bequeathed half his fortune to the creation of the Onassis Business Foundation, which in turn funds the Public Benefit Foundation. Specifically, 40% of the annual profits of the Business Foundation are given to the Public Benefit Foundation for the creation and implementation of its programs and initiatives. Since Onassis’s death, the Business Foundation’s assets have increased five-fold, and now include, among other assets, a fleet of 31 shipping vessels including oil tankers and bulk carriers. The success and growth of the Business Foundation has ensured that the Public Benefit Foundation has also thrived, and so have its programs, from hospital care to academic research to cultural diplomacy and beyond – thereby ensuring a better present and a brighter future for Greece.